All services rendered like trucks, forklifts, cranes and any other mechanical equipment provided by port or through its service providers usage is mandatory according to the rates decided. 1.2 Lump sum charges Pilotage, Berthing… USD 8,352/- per call of 24 hours and at one third rate thereon for 8 hrs shift. 1.4 For usage of Mobile silos to carry bulk barites, cement & Bentonite within KDWP from fixed silos to OSV for supply a user charge of Rs 5,127/- per Trip is applicable. a. A trip means movement of mobile silo in load condition in one direction and empty in return direction. If mobile silo moves in load condition in both directions then it is counted as two trips. b.The quality & quantity of cargo carried is to the account of party ordering the usage and usage of mobile silos is limited to carriage between the stations and manpower assistance for hose connections and delivery. c. When a ‘Non-Cargo Vessel’ is used for services of Crew Embarkation/disembarkation then it is to be charged at 50% discounted rate Item A(1.2) above of Lumpsum charges of Pilotage & Berthing as above and all other rates, terms and conditions remain the same. 1.2 Lump sum charges Pilotage, Berthing..USD 7,800/- per call of 24 hours and at one third rate thereon for 8 hrs shift. 1.4 As and when port provides crane suitable for cargo operation for OSVs berthing on Main jetty then the usage of port crane is mandatory and charges are additional. 1.5 For usage of Mobile silos to carry bulk barites, cement & Bentonite within KDWP from fixed silos to OSV for supply a user charge of Rs. 5,127/- per Trip is applicable. a) A trip means movement of mobile silo in load condition in one direction and empty in return direction. If mobile silo moves in load condition in both directions then it is counted as two trips. b) The quality & quantity of cargo carried is to the account of party ordering the usage and usage of mobile silos is limited to carriage between the stations and manpower assistance for hose connections and delivery. Note: For special category of vessels/requirements – Refer Schedule-VIII. 1. For Navy / Coast Guard vessels of LOA (length over all) upto 90 meters calling at KDWP port are chargeable for channel usage, tugs, navigational support & Berth hire at a lumpsum rate of INR 1,99,500 for every 24 Hours and at one third rate per eight hours shift thereon. 2. 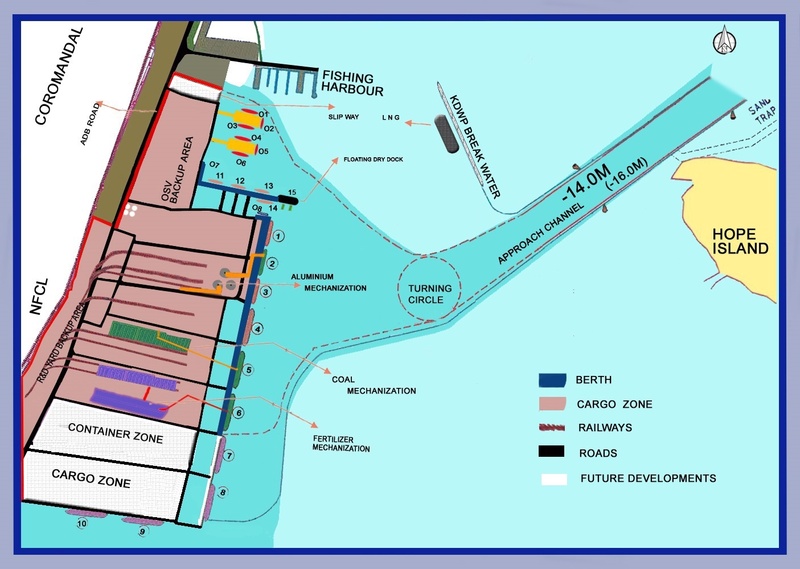 For Navy / Coast Guard vessels of LOA (length over all) above 90 meters calling at KDWP port are chargeable for channel usage, tugs, navigational support & Berth hire at a lumpsum rate of INR 2,99,250 for every 24 Hours and at one third rate per eight hours shift thereon. 3. Pilot services, if required for each entry (Inward & Outward) is chargeable at Rs.1,15,500 /-.